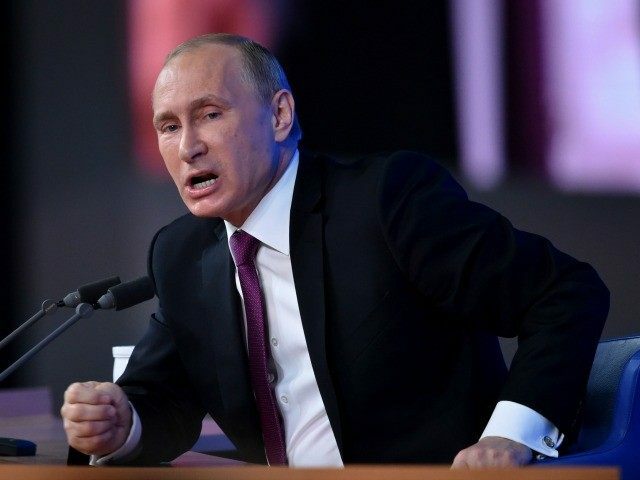 Russian President Vladimir Putin accused the U.S. of leaking the flight path of a downed Russian jet to Turkey, allowing the latter country to shoot it down. Turkish forces shot down a SU-24 bomber on Nov. 24 after the jet allegedly violated their airspace. The forces claim they sent the jet numerous warnings, but Russian officials saidnone were received. The Turkish military released audio of the warnings sent to the Russian plane the following day, but Russia said the recordings are fake. Putin told the media that Russia is willing to “cooperate” with the West in Syria against the Islamic State (ISIS/ISIL) but does not believe the West is ready to work with their coalition. “At the moment, unfortunately, our partners are not ready to work within the format of single coalition,” said Dmitry Peskov, Putin’s spokesman. If Russia and the U.S.-led coalition do work together, Putin warned, their ties would be fragile, given that one of the members of the coalition, Turkey, shot down their warplane on Nov. 24. On Saturday, Putin passed numerous economic sanctions against Turkey. Earlier this week, Dmitry Medvedev warned that the many joint projects between the two countries could be in danger. The Turkish government “commissioned Russia’s state-owned Rosatom in 2013 to build four 1,200-megawatt reactors in a project worth $20 billion.” The TurkStream pipeline project could be affected as well, a project intended as a way to transport natural gas to Europe without going through Ukraine.